Learn to perform one of close-up magic's most enduring classics! The invention of the Color-Changing Knives is usually credited to illusion designer Walter Jeans and as the effect began to enter the literature of magic in the 1930's, close-up magicians were immediately taken by the visual nature of the trick. 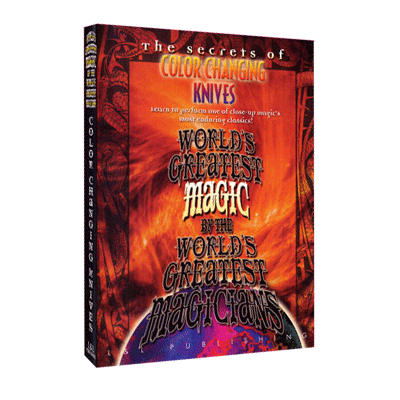 Over the years, a good number of the world's top close-up performers have presented the knives as a part of their professional repertoires and five of them are on this volume to show you their astounding versions. Bill Malone begins with his routine - an amazing and inherently funny routine that he uses in his walk-around work for some of the world's top corporate clients. Johnny Thompson is next with a typically engaging routine while one of magic's true poets, René Lavand, weaves a love story around the knives. Steve Draun presents his version that has a surprise ending that instantly resets - perfect for walk-around engagements - and Daryl presents his routine with knives of his own invention that ends with an unbelievable finish that leaves the knives in an impossible condition that can be examined by the spectators. Pocket knives are interesting personal objects and, while they're not commonly carried as they were in Walter Jeans day, people are still aware that they don't magically change color or size or appear and disappear at will. Thus, the Color-Changing Knives remain one of the most popular and intriguing effects at the disposal of a close-up magician and on this video, you'll find some truly great routines, plus enough moves and ideas to construct an amazing routine of your own!